Mirror Trader Review - Scam Exposed! We’ve received multiple reports from our readers that Mirror Trader is a scam, so as usual we decided to conduct our own investigation to find out the truth. Read all the details you need to know in our Mirror Trader review before signing up! We’ve seen this time and time again. One binary trading software after another appears out of nowhere offering to make you millions of dollars, only to siphon investors’ money away and disappear without a trail. Mirror Trader scam operates in exactly the same way. 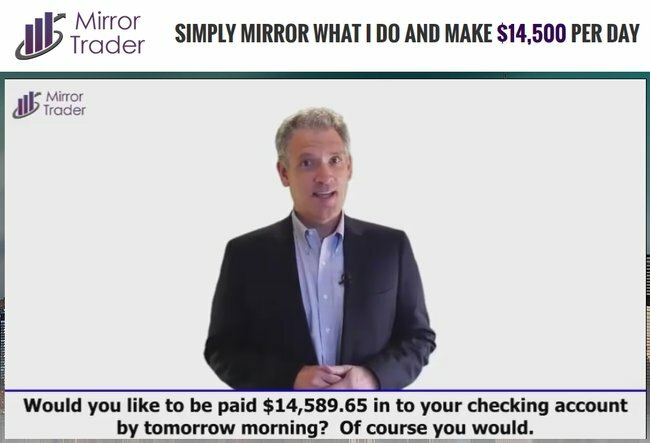 John Harrison, the alleged founder of Mirror Trader software couldn’t help but to generate hypes from the very beginning of their sales video. You were promised over $14,000 per day profit right from the beginning of the sales video, and in the headline right above the video. These are just marketing tactics used to keep you interested to watch the sales video. It’s in the sales video where the scammers try to brainwash you into buying the scam. Is there really a free, miracle software on the internet that makes money for you on auto-pilot? Unfortunately, the answer is NO. There are a lot of binary trading softwares out there that claim to make you thousands of dollars automatically, but don’t get fooled. If you don’t have any experience with binary options and automated softwares, read the next segment for a quick run-down of how it works. Otherwise, scroll to the segment after the next for the evidence we’ve collected to prove Mirror Trader is a scam. Binary options is a trading instrument popularized in recent years due to its simplicity compared to other instruments such as stocks and Forex market. This is how it works – let’s say I predict the price of GOLD market will be higher 1 minute later, and I bet $50 on a 1-minute binary options contract. If I’m right, I win a certain percentage of what I bet, usually 60% to 80%. But if I’m wrong, I lose the entire $50 that I bet. As you can see, trading binary options is not that different from gambling. There’s no way to predict the market movement in such a short period of time, because market movement in this timeframe is random. Mirror Trader comes in as a software that trade binary options on your behalf. John claims that you can make $14,500 per day risk-free and guaranteed, without having to do anything. Ironically, trading binary options is all about taking massive, unfavorable risks. As you scroll down from the sales video, you’ll see a series of member profiles and the profits they have made with Mirror Trader software. These profiles are complete with pictures, full names, their country of origin, the length of their memberships as well as the total profits they have made. 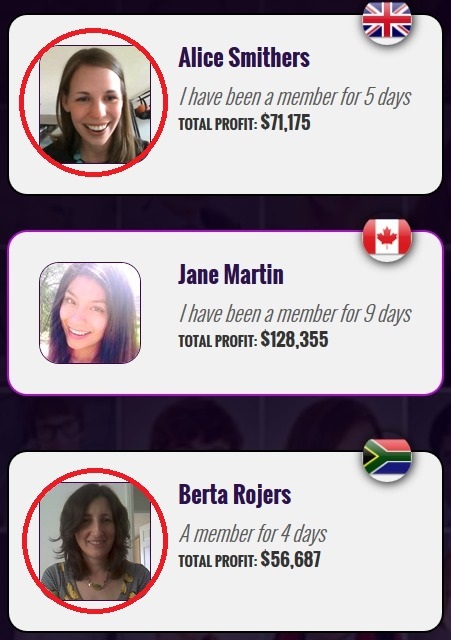 Mirror Trader seems to have members from all over the world, and each of them is making an average of $14,000 a day just as promised by John Harrison. However, the real question is – can we even trust these profiles? We decided to run a background check based on the profile pictures provided in the sales material, since it’s the only verifiable element in these claims. Turns out the very same pictures have been used in another scam we’ve reviewed earlier – Profit Maker scam. Compare the pictures featured in Mirror Trader against those of Profit Maker. Even when using the same pictures, these members were given different names. These names were fabricated, just like the profits displayed. 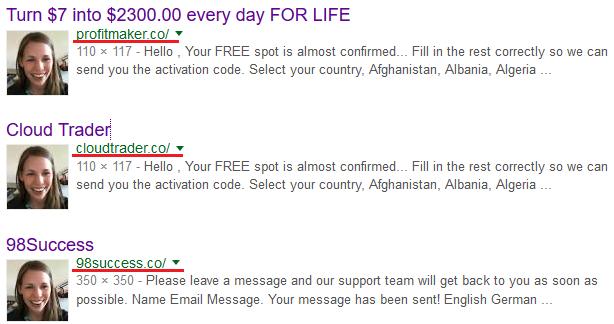 This proves that the scams are indeed related to each other and quite possibly operate under the same group of scammers. And it doesn’t end here. The number scams that are produced by the same group may far greater than just 2, because we discovered a series of scam sites using the same set of pictures. These scams include Cloud Trader and 98Success scams, which are all binary options trading software scams with similar sales pitches. This forms a network of sister sites that are very similar to one another, but distinct enough so that the average victims cannot tell them apart or draw any kind of relationship among them. It’s only under close scrutiny that small evidence like fake member pictures can be detected. Unfortunately, most victims just sign up without doing any kind of research of their own. Mirror Trader was trading when the market was closed? There’s a section in Mirror Trader website where it displays the “live trade results”, which shows a series of winning trades made by the software. Anyone who have traded binary options before knows that the market operates 5 days a week, from Monday to Friday. There’s no trading activity on weekends. This review was written on a Sunday, on 3 July 2016 (refer to the date in the screenshot above). 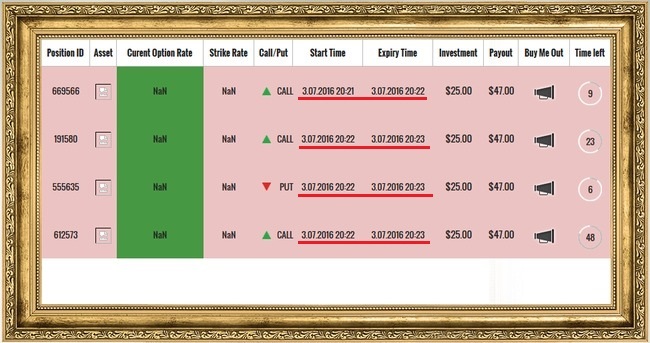 According the “live trades” panel, the software was still making trades on a day where there’s no market activity. So how did Mirror Trader manage to display live trade results on a Sunday? The truth is, the live trade section for Mirror Trader was just a fake results panel generated using a computer script that pair fictitious results with the current time. No real trades have been performed behind those flashing numbers. Is Mirror Trader a Scam? YES, MIRROR TRADER IS A SCAM. We strongly advise you to stay away from the scam if you don’t want to lose your hard-earned money.